Dear Friends, it has been a little while since our last newsletter but a lot has been happening in that time! We have welcomed Sophy part time to the team at One Marine. Sophy comes to us with a passion for selling and has gained a comprehensive sales knowledge having worked for years in the motor trade, for brands such as Alfa Romeo, Honda, VW and more. 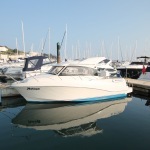 She is a already keen boater and will be working at the Torquay Marina office every Friday, Saturday and Sunday. She will facilitate viewings and answer your enquiries over the weekends. We have successfully handed completed on two of our previous featured listings. 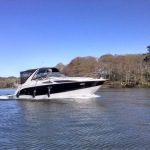 The wonderful Sealine F33 and Fairline Targa 34 are off to lucky new owners. Just in time for some springtime sunshine. Our friends on Lake Windemere have up for sale their super popular Bayliner 315, kept all her life in freshwater and looked after by extremely caring owners, who have upgraded the bathing platform and much more. A very special listing for a nearly new steal of a boat, with only 30 engine hours and fantastic specification upgrades she is one not to miss. Our very own Torquay native ‘Nataya’. An extremely practical compact weekender from Quicksilver with all features you could want, hob, portaloo, 2 berths, deck shower and more. Perfect for fishing or family days on the waves. You might have noticed our very own Tom Wills down at Darts Farm Shop in Exeter the other weekend with our friends at H.R. 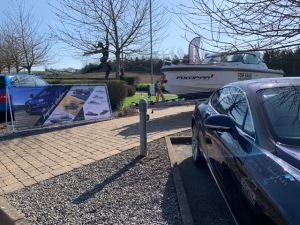 Owen Specialist cars showcasing the exciting new AXOPAR boat. 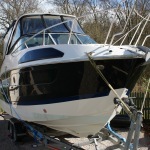 The One Marine team also retail new Sunseeker & AXOPAR boats for the UK. If you are anything like us, with all that sunny weather last weekend, you’ll be desperate to get out on the water. And now the clocks have finally gone forward, it’s officially British summertime again!